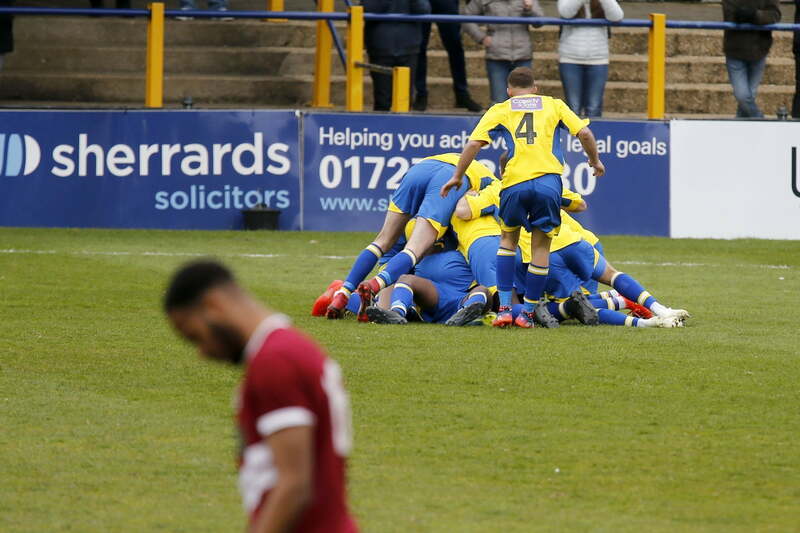 The Saints moved within two points of the play-off places as they came from a goal behind to pick up an important three points against Chelmsford City at Clarence Park. A cagey and at times poor opening twenty minutes saw both sides struggle to put their stamp on the game. The Clarets should have taken the lead with the first real sight of goal for either side when Scott Fenwick latched onto Lewis Knight’s miss-placed overhead clearance and drove forward before shooting just wide of the post. That opening seemed to wake the Claret’s up and they enjoyed a spell of twenty minutes of pressure which saw Dean Snedker called upon to make two important saves, the first from Wraight’s rifled long range effort, before the home stopper acrobatically batted Whelpdale’s attempted lob away from danger. Snedker, however, could do nothing to deny Whelpdale a second time as the forward drifted free of his marker and nodded home Billy Knott’s corner. With half-time approaching the Saints were presented with an opening before the break after Khale Da Costa was brought down by Spillane. Ben Wyatt’s curled free-kick caused Chelmsford problems and David Moyo was there to head past McDonald at the back post. Ian Allinson’s team talk clearly worked wonders as his side were leading just three minutes after the restart. Solomon Sambou, who battled throughout in midfield, won the ball in a central position and played an inch-perfect pass into the path of Da Costa and the wide-man powered into the box before crossing for Moyo who had the simple task of tapping the ball home. Things got even better for the Saints in the 55th minute and it was in spectacular fashion as Da Costa latched onto Shulton’s pass, turned on a six-pence, and lobbed McDonald from twenty yards out. Chelmsford City looked to respond but their hopes of a comeback were extinguished with eight minutes left on the clock when Billy Knott lunged in high and late on Tom Bender, earning himself a straight red card. Dean Snedker was forced into one more save before the ninety-minutes were out, getting down low to his left to deny Whelpdale a second of the game after his snap-shot had taken a deflection on its way through a mass of bodies. The Saints are back in action next Saturday and it is against another side inside the play-offs in the form of Bath City. Kick-off at Twerton Park is 3pm.